Doug, I know The Yosemite Bug gets a lot of first time visitors to Yosemite National Park. 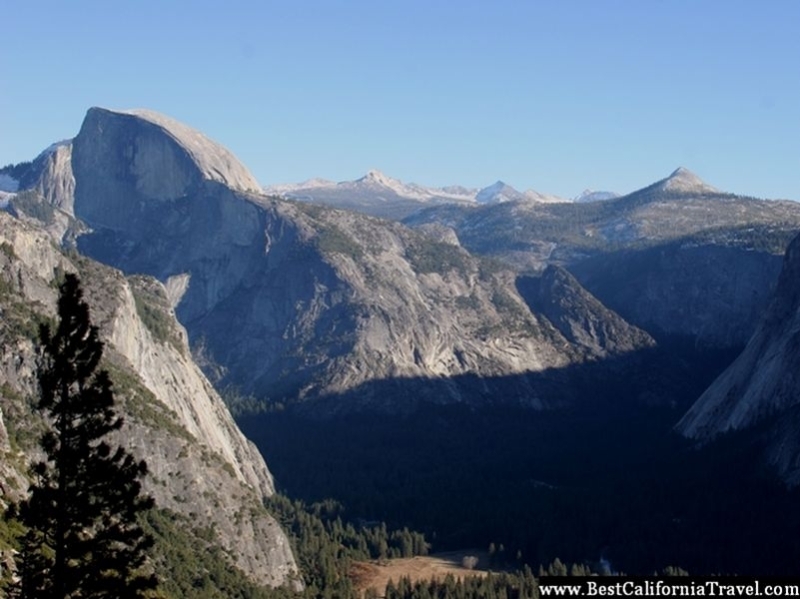 What are some attractions or hikes in Yosemite that you recommend people see? How about attractions or hikes for families with children? The Sierra Mountains and Yosemite Valley seen from the Yosemite Falls Trail. The Mist Trail going up to Vernal and Nevada Falls and then returning on the John Muir Trail back to the valley. This is probably the most popular hike in Yosemite and it’s popular for good reason. It’s just great and not too hard. It’s great for backpackers and families with children as well. Read my hiker’s guide for The Mist Trail in Yosemite. Yosemite Fall trail leading to the top of Yosemite Falls. This hike is not an easy hike! So, you have to be careful. It is a steep hike that can take anywhere from 6 to 8 hours round trip. However, the views from the top are simply breathtaking and to get to see where Yosemite Falls starts is a definitely a unique experience. 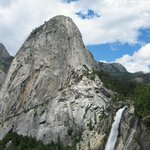 Read my hiker’s guide for Yosemite Falls Trail in Yosemite. Mirror Lake trail is the easiest trail in Yosemite National Park. And when I mean easy, it is easy and short. However, it’s best to go in the late spring so that there will be plenty of water in Mirror Lake. Otherwise, Mirror Lake becomes a small stream of water that is not very exciting to see. 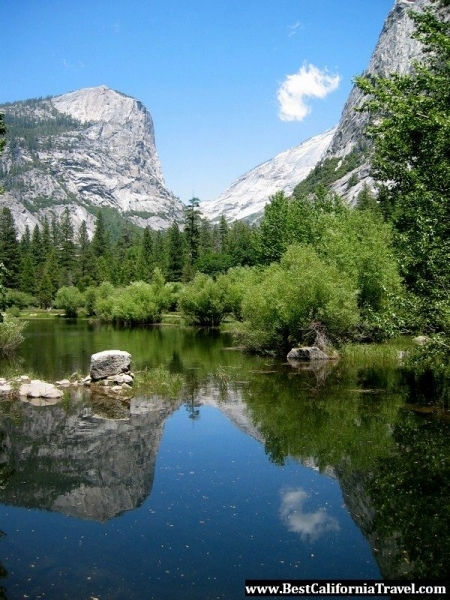 Read my hiker’s guide to the Mirror Lake Trail in Yosemite. Beautiful view of Yosemite mountain peaks reflected in Mirror Lake. 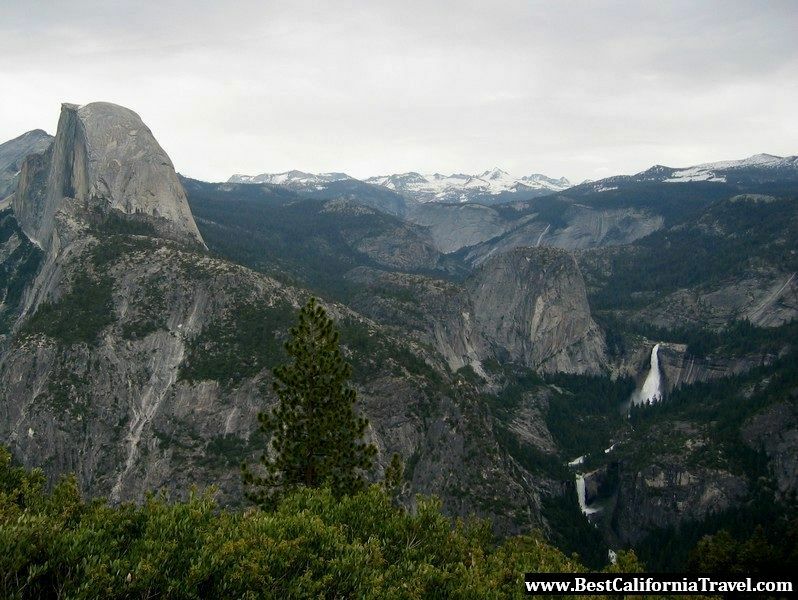 Amazing view of the Yosemite Valley from Glacier Point. IMPORTANT NOTE: I am not affiliated in any way with the Yosemite Bug. I have personally stayed two times at the Yosemite Bug, both with my family and by myself. I have not been paid in any way to write this article by the Yosemite Bug or its affiliates.